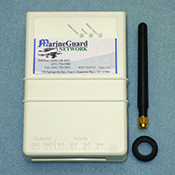 MarineGuard's Cell transmitter will work in the United States, Canada, and parts of Mexico (contact us for more info) as long as the area has cell coverage. The transmitter is both GSM and CDMA compatible. MGM-BC1: Monitors security sytem and/or high water alert (bilge) system. Inlcludes weekly status report. Sends text and/or email notification if an intruder trips the alarm. MGM-BC2: Monitors the security system and/or high water alert (bilge) system. Includes weekly status report. Sends text and/or email notification if (1) an intruder trips the alarm, or if (2) the alarm system is turned on/off. This feature is valuable if other people beside yourself have access to your boat. This feature lets you know when someone has entered your boat and disarmed the system. It also notifies you when the re-arm the system before leaving.